Mr. Rowan, Jr. officially joined Parkway Plastics, Inc. in 1969 after he graduated from Villanova University with a degree in Electrical Engineering. However, unofficially, he joined Parkway Plastics many years before that, standing shoulder to shoulder with his father in the trenches during the company's early years. Edward Rowan, Jr.'s humility, strength of character, vision, leadership, engineering background, and his keen business sense made him the natural choice to lead the company into the next generation. Later joined by his beloved wife, Mary K. Rowan, Secretary Treasurer, the two sucessfully ran the company for over 40 years. Mr. Rowan holds a Bachelors Degree in Economics from Colgate University and has an MBA in Accounting & Finance from Columbia Business School. He has also completed the Global Business Bridge Program at Oxford University. The program was created and taught by Tuck School of Business Faculty. In 2003 he established the Parkway Plastics, Inc. sales department. Mrs. Kelly earned her BS in Business Administration with majors in Finance and MIS (Management Information Systems) from Villanova University. She has also completed post-graduate work in French studies and international business at l'Universite de Nantes in Nantes, France. Prior to joining Parkway, Kirstin managed the Client Communications and Marketing Departments at Triton Partners, a small boutique investment firm and worked as an Associate in the Client Relations Department of Chilton Investment Company, another New York based hedge fund. Born and raised in NYC, Nannette is married with 3 wonderful children. Her favorite sport is tennis, she likes to fish, her favorite actor is Sidney Poiter, and she absolutely loves Carribean food. Her father Lee is her biggest role model and has been a huge positive influence in her life. You can find Nannette in her office with an ice cold Pepsi, her favorite drink. Never underestimate those you may think are the underdog. Tonia is originally from Plainfield, NJ and is the middle child and only girl. She is the mother of two sons who are her pride and joy. 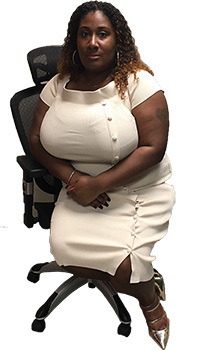 Tonia has worked in the Human Resources/AR field for the 7 years and is currently a student at Kean University, pursuing her Masters Degree in Accounting. She has hopes of one day becoming a CFO. Tonia also helps behind the scenes on a podcast show called BeardsnbaldHeads that airs on BKS1 radio in her hometown. If you are looking to get qualified as a vendor/supplier for Parkway Plastics please feel free to give her a call, but be warned you will need to bring your A game! Accounting, Finance, Computers, Deal Snatcher, Coupon NINJA! Parkway's Marketing and Social Media Manager, Tegan loves learning new things, applying what he learns and seeing results. Have a comment or question about Parkway’s website? Reach out via email: Tegan@ParkwayJars.com or give him a call: 732.752.3636 x114.